From May to September each year Westerdam cruises the last frontier – Alaska – discovering her icy straits and rugged landscapes as she sails seven nights between Vancouver and Seward (or vice versa). 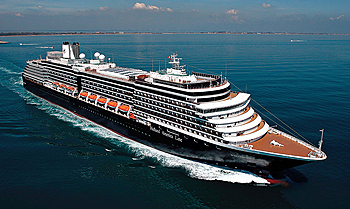 As the weather cools down in Alaska, Westerdam heads into Asia. While she does feature some shorter 10 to 14 night itineraries, most of her Asia explorations are in depth discoveries of up to 30 days! View all Westerdam cruises, view a selection of Holland America cruise deals, or view more options for Holland America cruises. Be sure to check out the new Exploration Central located high atop the ship; it’s the heartbeat of the Holland America Line destination experience. Plus, Westerdam will be the first to feature the new Rijksmuseum at Sea. Holland America Line’s exclusive Explorations Central (EXC) offers indispensable travel resources and engagement opportunities that make the destination experience more engaging, vivid and meaningful for our guests. The Rijksmuseum, Amsterdam’s grand museum and home to more than 8,000 artworks in 80 galleries, is coming aboard the Holland America Line fleet. For breakfast, lunch or an unforgettable five-course dinner, the elegant main Dining Room is your destination for sophisticated dining, with menu selections from classic favorites to vegetarian options, to dishes inspired by the regions you’ll visit. Dive-In: For a perfectly grilled burger on brioche, gourmet hot dog, crispy French fries or a taco bar with all the fixings, there’s nothing better than alfresco dining by the pool at Dive-In at the Terrace Grill. Look for imaginative toppings and sauces to enliven classic burgers and dogs, along with veggie-friendly and healthier options, all included in your cruise fare. De Librije: Offered once per cruise, the Pinnacle Grill transforms into “Taste of De Librije” featuring the cuisine of Culinary Council member and Michelin Star Chef Jonnie Boer. Named after Boer’s restaurant in the Netherlands, the menu will showcase a selection of starters, soups, entrees and desserts from his land-based eatery. Sel de Mer: Sel de Mer (“sea salt,” in French) is an intimate seafood brasserie offering a contemporary twist on French seafood classics, with à la carte dishes ranging from fresh oysters to salt-crusted whole fish to bouillabaisse. In this unique art-themed bar, order from a menu created by Master Mixologist Dale DeGroff, a 2015 James Beard Who’s Who Inductee.